Surabaya Mount Bromo Tour Package 2 Days 1 Night or Bromo Tour Package From Surabaya 2D1N for visiting Mount Bromo with best view sunrise and hike to mt.bromo crater with meeting point pick-up from Surabaya airport,train station or hotel and end trip back to Surabaya with duration Tour to Mount Bromo from Surabaya for 2 days 1 night. Mount Bromo is one of part the natural scenery in East Java – Indonesia. Mount Bromo is be tourism most populer in the natural scenery in the world. There are several peak in the Bromo Tengger Semeru National Park, there are mount Batok beside of Mount Bromo, Mount Kursi, and Mount Semeru or Sumeru or Mahameru is the highest peak in Java and one of the most active volcano. 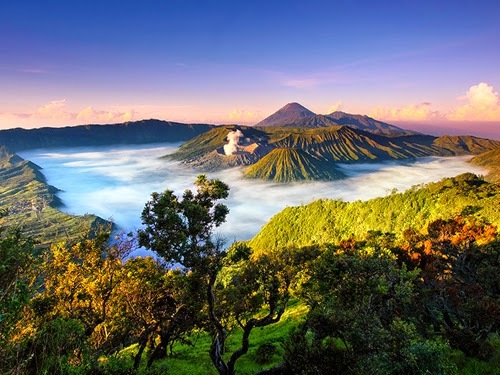 Mount Bromo Tour can be reached by trekking the crater walls and across the desert or sea of sand for around 1,5 km to the peak of Mount Bromo. After passing the 250 steps up stairs, we will find the best view of bromo crater . Mount bromo tour from Surabaya, short trip to mount bromo east java one of the most exciting experience for view moment the sunrise from pananjakan view point and sea of sand in bromo. Long distance Surabaya to Bromo around 3 hours driving, Surabaya city the closest location to Mount Bromo and the best place to start a Bromo tour package. Arriving in Surabaya for a trip to Bromo for sunrise and returning to Surabaya with a duration of 2D1N, you can choose Surabayabromotour.com as a good tour company where you don’t need to arrange tours before arriving or upon arrival in Surabaya. If you need a day tour without staying from Surabaya, please choose a full day tour package or Bromo Midnight Tour Package which is leaving Surabaya at night to travel to Bromo with sunrise and return to surabaya on the same day.Klick here for more info mount bromo tour package price.